She announced this like she was telling me that she’s decided to change cable companies or buy a yellow sweater. She’s thought about it, and decided, yes, it’s time to just go out, find a man who isn’t a weirdo, fall in love with him, have him love her back, and move forward with her life. I think I actually laughed, and said something sage and brilliant like “Grandma, it doesn’t really work that way.” I mean this woman had not been out there in fifty years, how ridiculous? Of course, that’s exactly the way it worked and, two weeks later, she announced that she was going on a date with a dude that she randomly started talking to in a donut shop. I’m reminded of this because I just found out that a former colleague of mine is getting married. I mean, awesome, good for you, but also – his wife died less than a year ago very suddenly. In less than a year he has processed that, put himself back out there (on match.com no less), found someone who wasn’t a weirdo, fell in love with her, had her love him back and moved forward with his life. I have dated a bit in the past year, and even have a date coming up that seems promising, but I think in some ways I have been trying to process every piece of my last relationship before I allow myself to move on. I am starting to think that is a big mistake. I am starting to think it is just an excuse to stay in a protective shell. I mean, this How Stella Got Her Groove Back fan fiction is really starting to write itself. New plan, scoping out donut shops. On the bright side, it’s been a pretty good week after a crap start to the week. I am in a book club, and it’s a really great group. We meet at a different restaurant every six weeks or so to talk about a book (for about 10 minutes) and catch up and drink wine (for several hours.) Every August we choose a “fun” book – otherwise we weirdly tend to choose and read books about World War II, a cycle we just can’t seem to break – and we go to the beach. This week was our beach meeting and it was very nice and then we almost went to jail. A very bored police officer came over to us at 9:30 p.m., literally the only people on the beach, sitting quietly and talking about books, and gave us a fun lecture like we were 18, and it was kind of great. We are total bad asses, sort of. 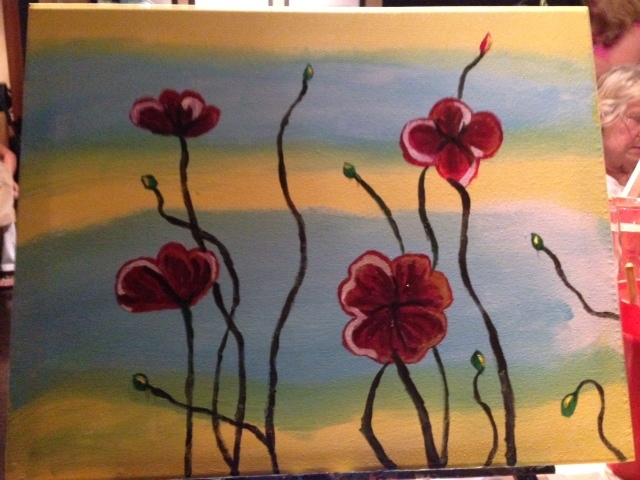 On Wednesday, Christine and I went to a painting class because, Groupon. I saw this deal, cajoled Christine into coming with me, signed us up and then arrived all before I remembered that I have absolutely no artistic talent at all. Small detail. But it was fun anyway, they walked us through every step and even though our paintings looked totally different from each other, they were both kind of not horrible. I kept getting irritated with how mine was turning out and finally she looked at me and said “Seriously? You’re going to take this home, throw it in a closet and then put it in the trash when you move. Have another glass of wine.” This is good advice.